Taking a simple story, a father searches for his kidnapped son, and although transposing it to tropical fish sounds insane, the concept works, with Albert Brooks overprotective clown fish Marlin travelling to Sydney to rescue his son, who in turn is doing his best to escape the dentist’s fish tank within which he recently became imprisoned. 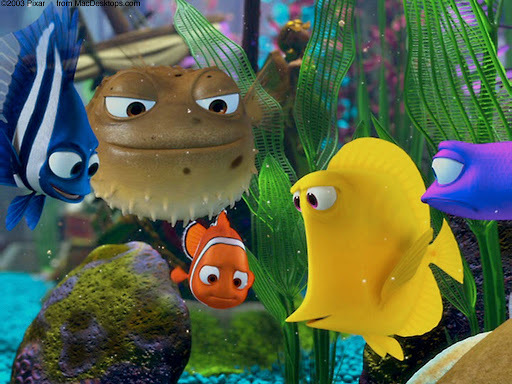 As ever with Pixar, it is the myriad of supporting characters that make the film truly great, here ranging from the cabin fever crazed fish tank gang (voiced by, among others, Willem Dafoe, Stephen Root, Alison Janney and semi-regular collaborator Brad Garrett) to Ellen DeGeneres’ short term memory loss suffering regal tang Dory, probably the most popular and oft-quoted characters from the film. Pixar rightfully uses the films running time to show off their immense design skills, displaying as many watery environments as possible (sewers, wide open oceans, docks, puddles) and a cornucopia of every widely recognisable aquatic lifeform, including sea turtles, jellyfish, sharks, pelicans, Aardman-inspired seagulls, stingrays, swordfish (fencing with upper class English accents), angler fish, whales and Bostonian lobsters. It says something of the animating skill of Pixar that they had to degrade the quality of the water in this film, as initial feedback showed it was too realistic. Given enough time, I wouldn’t be surprised if they were able to make a seemingly live action film without anyone noticing. This entry was posted in 08/10, Choose Film, Empire Top 301, Empire Top 500, Review, The List and tagged Albert Brooks, Alexander Gould, Alison Janney, Andrew Stanton, Barry Humphries, Brad Garrett, Ellen DeGeneres, Finding Nemo, Geoffrey Rush, Pixar, Willem Dafoe by jaycluitt. Bookmark the permalink.